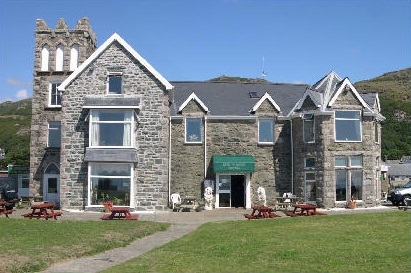 The Min y Mor Hotel has a licensed Restaurant, Bar, Family room and Function Room, all are open to non residents and offer free wifi access. The Restaurant has a good reputation locally and among visitors alike with our Chef's traditional and vegetarian dishes using the best market ingredients available and in generous quantities. The residents Menu is changed daily. All special diets can be catered for with prior notice. Our Restaurant is an ideal venue for weddings, society dinners and that Special Party from a quiet table for two to a large gathering of up to 120. 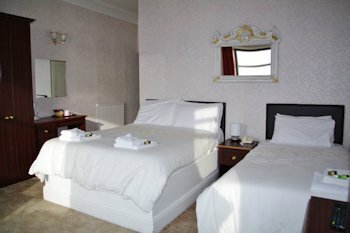 All the rooms in the hotel are en-suite and have Tea/Coffe making facilities, TV and Telephone. Ground Floor Rooms: We have 6 ground floor rooms for those people that can not manage stairs. Hikers and Walkers: Drying room available for the people who go out in all weathers. Mountain Bikers: For the Bikers we offer a drying room and a safe bike storage area. We have a spacious guests lounge area with sea view. Marine Promenade, Barmouth, Gwynedd, LL42 1HW.